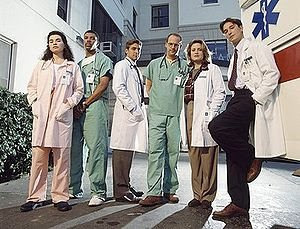 ER premiered Sept 19, 1994 and was the creation of the late Michael Crichton. (Crichton wrote the screenplay for ER based on his experiences as a resident.) On Thursday, April 2nd, after a 15 year run, the series finale aired on NBC, entitled "And in the End..."
I haven't watched ER in many years. I stopped watching shortly after I started medical school because I just couldn't take the medical drama anymore. But I just couldn't help myself from tuning into the finale. When I watched ER in the past, it was not from the perspective of a palliative care doctor. I was pleasantly surprised Thursday to find several palliative care themed plot lines. First off, one of the main plot lines was actually based on a true story. Executive producer, John Wells, 17 year old niece died from alcohol poisoning in December. This plot line, in which a teenager is brought in after a night of binge drinking, was written to raise awareness about this issue. Another case involved a gentleman with AIDS brought in for breathing difficulties. After a workup, he is diagnosed with cancer. When the resident brings up chemotherapy to buy him a few more months, the patient refuses saying that for years now he has just been living for all of his friends who have died from AIDS. "I've been trying to live for them, you know, keep their memories alive. But I've had my time. No regrets." He goes on to describe an experience skydiving and hopes that death feels the same. Resident: Is there anything I can do for you? Patient: Yeah, there is. I don't want it to hurt. Resident: We can help with that. But to me, the most impressive story was that of an elderly MS patient admitted with pulmonary edema and sepsis. (Sorry, I couldn't find a good clip of this. But the full episode can be legally watched on the NBC website here.) The doctor explains to the husband that they can give his wife IV fluids but it will only do more damage to her lungs. When her husband wants more aggressive things done, the doctor explains that even with aggressive treatments her life will only be prolonged by a week or two (He prognosticates while having a goals of care conversation! Is this the first time that has been seen on TV?) and these things will just prolong her pain and suffering. He then says "It's time to talk about how to make her as comfortable as possible." Later in the episode, the husband is upset that his wife has an apneic episode. The nurse explains that irregular breathing is a normal part of the dying process. That's quite a bit of palliative content for one episode (even a 2 hour episode). Maybe someone who watches regularly could tell me if this has been the norm. I think that death is commonly dealt with on ER but what I find interesting in this episode is how it is dealt with more as a natural part of life, not always a struggle. Comfort is actually brought up in both of the last two story lines I mentioned. So, farewell ER! While I haven't been a devoted follower, I am a fan of this episode. I recall the very first episode, where Dr. Green is repeatedly woken up from his fitful sleep in the on call room. 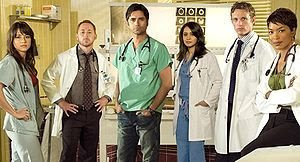 I enjoyed the first few seasons, because of the accuracy of the medical scenarios. I found that, as the years went by, it became much more a soap opera than a medical show, and sensationalism ruled the day (witness the helicopter crashing in to the hospital episode...). I am please also with the final episode and its treatment of palliative care, though my experience with the show prior to that was not so favorable. I saw a lot of discussion about high tech, which was nearly always successful. Death was dealt with, but more as the exception rather than the rule, even with chronic progressive disease. I was very disappointed with the series over the last few years, and for that reason, stopped watching, though my wife would alert me if something particularly interesting was occuring. I completely agree. Way to soap opera. Another interesting thing, the name of the episode "And in the End..." But in the end there was no big bang, not even a lot of wrapping up (a bit). Like you say, life goes on. No ER exploding or bioterrorism, just pretty normal everyday cases (which I respect and is why I liked the episode). So I was thinking what is at the end of the title. "And in the end..." what? So I did a quick search for the term. Seems appropriate for the finale episode. I guess I am showing my age here, but when I saw the title, I thought of the the Beatles song, which I think was at the end of side 2 of Abbey Road (their second to last album). The lyrics were, "And in the end, the love you take is equal to the love you make." A fitting end for the Beatles, and probably for ER also! I think that one could apply as well.